Dimension-hopping is difficult enough for even the most experienced superteams, but when the “team” making the hop isn’t even technically a team yet, it can get rather dicey, as we learn in this week’s sophomore chapter of YOUNG JUSTICE. In last month’s issue #1, the team came together to battle an unexpected menace from Gemworld, the crystalline realm known for its ruthless power dynamics and heroic princess, Amethyst. In the process, they seem to have been pulled into Gemworld themselves, a fact that appears to be easier to accept for some members of Young Justice than others. Speaking of which, it’s still unclear that Young Justice is even a thing. Impulse sure wants it to be, but no one else has been quite so ready to commit to being part of a new superteam. 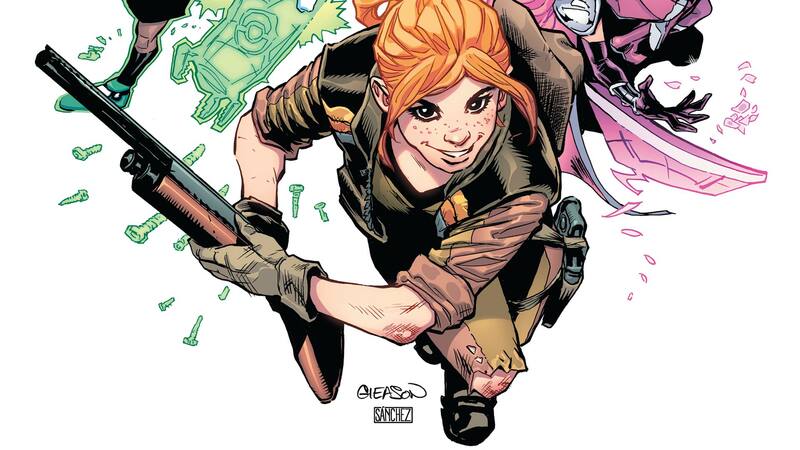 And there’s also the fact that several of the young heroes drawn into this battle are wild cards, like the gun-toting Jinny Hex and the never-before-seen Teen Lantern. And then there’s Amethyst, who obviously has a vested interest in how this battle turns out. Tim Drake seems more than eager to fight alongside her, but what does the group really know about her and the state of Gemworld anyhow? Look for answers to the last part of that question in our exclusive preview of issue #2, which lands in stores this week. YOUNG JUSTICE #2 by Brian Michael Bendis, Patrick Gleason, Emanuela Lupacchino, Ray McCarthy and Alejandro Sanchez is in stores Wednesday.